If this sounds interesting you are probably asking, “how much will this cost?” There are several clubs in the area based on meeting times (breakfast v. lunch) and geography. 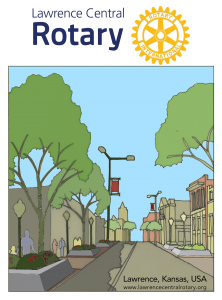 Lawrence Central Rotary updated dues structure has two options. Plan 1 is optimal if you will be attending at least 8 or more times per quarter as it includes meals. Plan 2 bills meals as attended. Under both plans, we will be invited to contribute to the Rotary Foundation as a line-item on your bill. It is our way of reminding you that we would like you to include that amount in addition to your payment for dues and meals.